Without question, Tesla is one of the hottest names in the automotive industry today, and there’s good reason for that. Tesla is a constant innovator that is perhaps closer than any other brand to bringing the electric car to prominence. The only thing standing in its way (well, apart from a well-connected dealership lobby) is making the product more cost-effective for a broader audience. Fields was clear, however, that these plans do not involve buying a stake in Tesla. Rumors abound that both Ford and General Motors have a vested interest in acquiring Tesla, but no solid evidence suggests that representatives from other company have made serious inquiries, nor that Tesla is for sale. During an interview on CNBC’s “Squawk Box” that took place during the launch of 2015 F-150 production, Fields said that fuel economy is still a difference maker for car buyers—particularly those who are shopping for new trucks and SUVs—and that this has been the case for more than two decades regardless of fuel costs. “Our long-term view is that over time, the price of a barrel of oil is going to continue to go up. It’s a non-renewable resource,” Fields said. 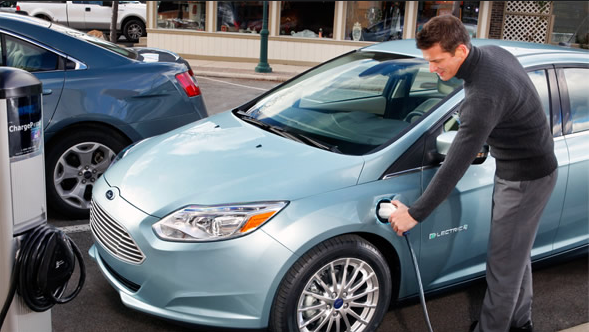 As for the Tesla competitor, Fields told USA Today that a dedicated electric vehicle was consistent with Ford’s product philosophy, and that Ford bought a Tesla Model S in order to test it out and see what makes it tick.